For lovers of traditional Japanese culture, photographers looking for the perfect shot, or anyone who enjoys getting caught　in the middle of a huge crowd surging dangerously with unbridled passion,　there was no other place to be last weekend than Asakusa,　where the Sanja Matsuri　(三社祭) was held. It is on the 3rd Friday,　Saturday, and Sunday of May that every year the descendants of the old Edo Townspeople put on their colorful festival wear and throw off all their inhibitions as they join local gangs of yakuza and troups of geisha to put on what is probably the biggest block party and the most exciting rave in the world. This year, however, I was a little hesitant about going. I had heard it announced that the climactic portion of the festival, Sunday evening’s wild procession of the three huge and ornately decorated omikoshi (お神輿),or portable shrines, would be cancelled. This was said to be because during last year’s revelry, certain yakuza members had disobeyed direct police orders and climbed on top of the sacred palanquins proudly displaying their full-body tattoos. It was emphasized that not only did this constitute civil disobedience, but was also by having exposed buttocks on top of the vehicle of the Gods, highly sacrilegious. 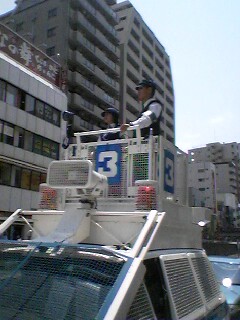 A Sanja Matsuri without its famed finale did not seem very attractive to me. The only thing that gave me the impetus to get up early on Sunday morning was the TX, which has made getting to the festival so fast and convenient. I was surprised to find that the new train line itself had already become connected with the famed and ancient festival, with groups of participants, already tipsy at 9am, boarding the train at Kita-Seju station and using the TX Asakusa station as their changing room. The police were certainly intent on keeping order and had actually set up observation posts with video cameras to record any possible violations. 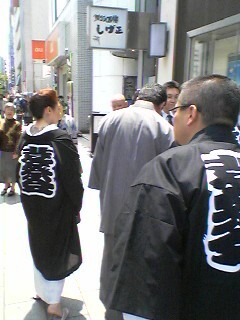 Just next to one of these police posts, a group of yakuza had gathered, dressed according to their rank. 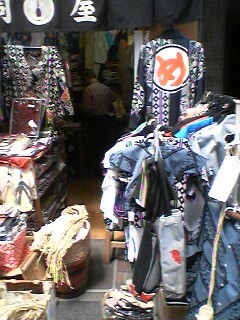 The boss’s wife was dressed in a festival coat (hapi) which still revealed at the nape of her neck, her full-body tattoo. I heard the boss greet his men, warming them to cause no trouble this year. I guess the other bosses urged the same, as this year’s bacchanalia was not as raucous as in past years. Instead I tried to observe little details which I will write about in future entries. One interesting thing I did learn, I would like to mention now. I was wondering why almost no people who lived in apartments with balconies facing the festivities were watching from above. I was thinking about maybe asking someone to let me take pictures from their balcony. By asking, I learned that since the Gods were supposed to be riding the omikoshi, it would be disrespectful or even sacrilegious to look down on them from above. Next year I hope Sanja Matsuri will be back to normal. Before that, there is always my favorite festival, which is even nearer to Tsukuba: the 3 day Ishioka Festival which takes place in September. I will tell you more about it before then. using the Tsukuba Express and getting off at Asakusa. Tomorrow (Sunday) is the most exciting of the events three days. I highly recommend it if you don`t mind crushing crowds and lots of noise. If yo are planning on going let me fill you in on the festivals history. The Sanja Matsuri is the festival of the Asakusa Jinja Shrine located in Taito Ward , Tokyo, just to north-east of the much more famous Senso-ji Temple. Another name for this shrine is the Sanja Myo-jin Shrine – the Shrine of the Three Deities. Centuries ago, two fisherman pulled up something very unusual in their net while out on the Sumida River. It was an image Kannon, the Goddess of Mercy. They took it took local landlord who eshrined it in a proper hall and carried out prayers and rituals in its honor.That very same image, it is said, is the main object of veneration at the Senso-ji Temple. Meanwhile, the two fishermen and the landlord were deified as divine spirits at the Asakusa Shrine next-door. The Sanja Matsuri, now held on the third weekend of every May was – and still is, one of the Three Great Festival beloved of the Edo (now Tokyo) Townsfolk – along with the Kanda Matsuri and the Sanno Matsuri. Sunday, the final day is when things get most exciting as the three portable shrines carrying the spirits of the three deities are carried and shaken through the streets of Asakusa . When the three MIKOSHI (portable shrines) meet up and their bearers try to outdo each other in their enthusiasms is the climax of the three-day event.